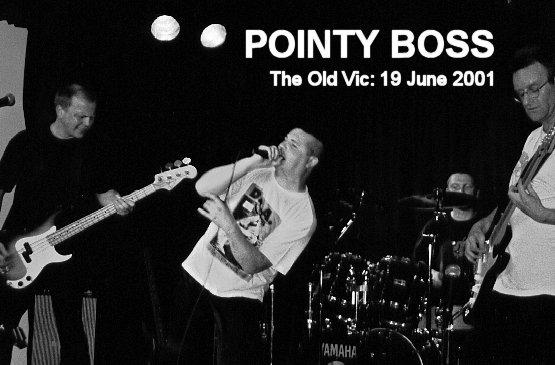 Around sixty people, scattered around the aircraft hangar that is the upstairs at The Old Vic, turned out to watch the Pointy Boss and The Spice Pistols knock out some top tunes on Tuesday 19 June 2001. Technical problems (like a completely silent PA system, and the absence of the sound engineer to work it) left things running behind schedule, as the one-CD disco worked overtime to hold the audience's attention. Eventually, things fell into place, soundchecks were grabbed, and the evening got underway. First up, The Spice Pistols took to the stage to serve up a tasty set of punk and new wave classics. Audience favourites included The Clash's London Calling and Blondie's Hanging on the Telephone, but there were loads more goodies to choose from. Shamefully, The Old Vic shut both bars early, depriving Pointy Boss  and especially Nik just-water-for-me Smith  of post-set beer, so the band's £12 profit went unspent. More photos from the gig are on display in the Gallery.